Sophie Stone signing, not singing. 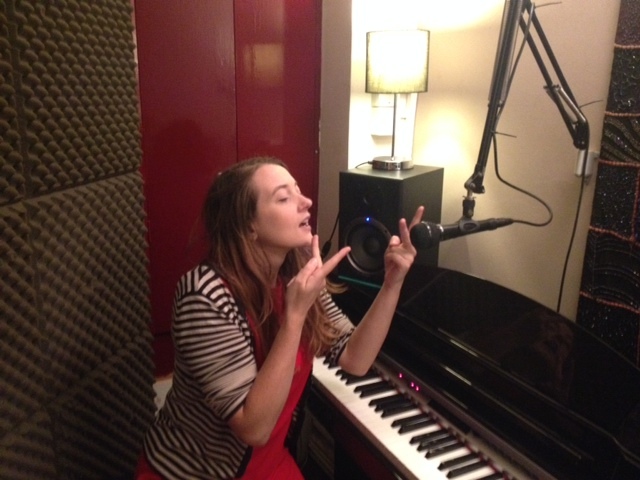 I’m in a small sound studio in Camden, watching Sophie Stone transform my written text into three dimensions. She has been working with my long term collaborator Jean St Clair on translating sections of Woman of Flowers, my commission from Forest Forge Theatre, into theatricalised British Sign Language (BSL) or visual language. I was unable to make these earlier sessions as I was at the Cork Midsummer festival, so Sophie and I are refining the work, preparing for a rehearsed reading of the script at Salisbury Playhouse in front of an invited audience. This project is something of a dream one. Kirstie Davis, the artistic director of Forest Forge, came to see the National Theatre Wales production of my performance text In Water I’m Weightless in 2012, and fell under the spell of Sophie Stone, one of the performers. Kirstie and I sat together in the cafe after the show, scheming, plotting, dreaming up a way of working together again, and including Sophie. ‘If you were do something original for Forest Forge, what would it be?’ she asked, and I told her of a contemporary retelling of an ancient myth, filled with transformations and magic, desire and murder – a world where nothing is quite as it seems. ‘Oooh, yes, we’ll do it!’ Kirstie said as our imaginations entwined, and we clapped our hands and jumped up and down in our seats, laughing. Laughter is continuous when working with Kirstie Davis. Her rehearsal rooms are joyful and creative places, filled with possibilities. Even in these austerity times, when funding is increasingly difficult, the arts given less and less value and projects are constantly under threat, Kirstie and her team at Forest Forge still make things happen, and with smiles on their faces. Sadly, it is so easy to be negative about the future of the arts in the current climate, but Kirstie and Forest Forge are resilient, inventive, and optimistic. They have a loyal and supportive following, too, which buoys the company up and is massively appreciated. A fundraising drive earlier in the year saved this production of Woman of Flowers and I’m grateful to all who supported the company, for the opportunity of making this work, which I hope will be inventive, emotionally engaging, and with resonance for our times. Woman of Flowers uses a mixture of spoken and visual languages, and will be surtitled throughout. I will write of the content more in a future blog. It will also incorporate movement, choreography, video, live music and an original score by Rebecca Applin. When we gathered at Salisbury Playhouse to read the script aloud for the first time, designer David Haworth was also there, presenting his model box design for the production. Designer David Applin presents ‘Woman of Flowers’ design to the cast of the rehearsed reading, Salisbury Playhouse. After just five hours of rehearsal, we presented the work to an invited audience. As a playwright, it is always magical hearing the words you have written outside your own head that first time. The choices the performers make are often surprising, and enriching – their questions stimulating and often challenging. I strive to give a lot of space to my collaborators, especially when working with this kind of material, shape-shifting and poetic, where nothing is quite what it seems. Some of my answers to specific questions are ‘open’ – ‘yes, it could be she is lying; but then again, she might be telling the truth.’ I’m sure such apparent evasiveness can be frustrating to an actor who seeks a strong foundation to build their performance on, but it’s easy to give definite answers and for me, that is a closing down of possibilities rather than an opening up. Once in rehearsals, there will be three weeks of exploration and discovery, and so I always endeavour to leave space for the director and actor to make their work, and, invariably, surprise me with their interpretations and discoveries. This issue was taken up in the Q&A after the reading, and both Kirstie and I spoke of the necessity of trust. I am fortunate to have worked with her before, on a production of my play peeling in 2011, and a strong, mutually-respectful relationship was built then. I find Kirstie a wonderful collaborator. Apart from her imaginative and inventive productions, she has a wonderful regard for the audience and awareness of that dynamic between the spectacle and the spectator. That focus brings an immediacy to her direction and alongside the excellent performers she casts, it creates a strong connection with the audience. I was shaken to see members of our invited audience in tears after the reading, and several spoke generously about the emotional impact the work had and how excited they were by the content and the presentation. This was immensely gratifying for us to know – a large part of a rehearsed reading is to test the script and see if it is working – and the emotional response reflects the commitment and skills Kirstie and the actors brought to our short rehearsal process. Given the response to this early part of the process, I can’t wait to see what happens when we are deep in it. Guest blog: Medea – Theatre work with Deaf teenagers. Publicity image for MEDEA! ME DEA F! The last September weekend, the last shows of „MEDEA! DIE WAHRHEIT! ME DEA F!“ (Engl. „MEDEA! THE TRUTH! ME DEA F!“) took place in Ballhaus Ost Berlin. This production unites Deaf and hearing actors and actresses, adults and teenagers, professionals and amateurs. As a production assistant I was deeply involved in the process of staging a Greek myth with Deaf and hard of hearing teenagers. 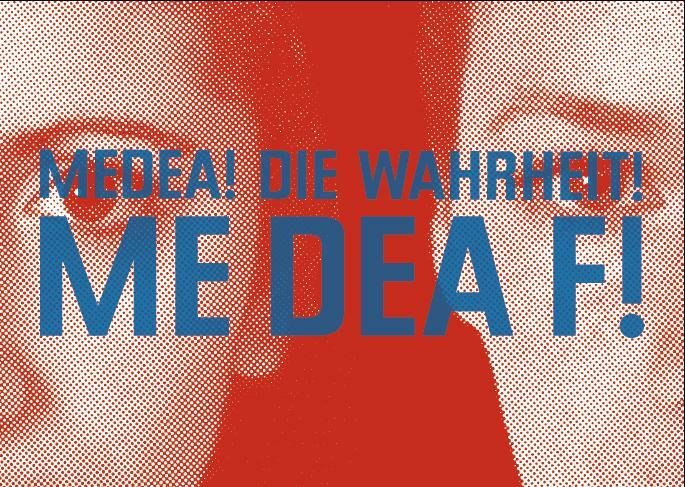 „MEDEA!“ is the second theatre production of the Berlin based group Possible World and premiered in December 2011. The hearing director Michaela Caspar wanted to work with Deaf teenagers in an artistic project and thus cooperated with a school for the Deaf. The aim has never been to start a pedagogical project, but to make art – with the means and potentials that Deafness, sign language and the young age of the protagonists provide. Michaela decided to cooperate also with professional hearing actors, so that the group was mixed and the members could learn from each other. The shows were to be in speech and sign alike, directed to Deaf and hearing audiences. It was quickly decided that most of the roles should be played by two actors – one speaking and one signing. The production was not based on the Euripidean Medea, but on a play that the author Till Nikolaus von Heiseler had written for the group, telling the story of Jason and Medea meeting for the first time, stealing the Golden Fleece from Medea’s father and fleeing to Greece. All in all a rather archaic plot, starring goddesses and kings, full of conflicts between empires, sexes, generations and – not surprisingly – Deaf and hearing. Working with texts is always a challenge when Deaf people are involved. Most of them don’t think in words, but images. Deaf culture lives from face to face communication, not from scripture. Furthermore, learning to read means to learn the connection between graphic symbols and sounds – if one doesn’t perceive the sounds, this process is incomparably more difficult. As most of the involved teenagers’ families migrated to Germany, neither German Sign Language (DGS) nor German are their native languages. The communication in the families is rather in Turkish, Armenian or Russian. As a consequence understanding the original text of the play, written in a beautiful poetic language, but not easy to unterstand immediately even for German native speakers, was virtually impossible for the teenagers. So it was the task of the team around interpreter Anka Böttcher to make the plot and the scenes accessible not only to a Deaf audience, but as a first step to our Deaf actors and actresses. We talked a lot with them about the general plot, but also about myths, Ancient Greece, the characters and their motivations and the situations they find themselves in. As a textual basis, we „translated“ the original text in contemporary German and read it together with the actors and actresses. Anka provided a first rough translation in DGS which we discussed together with the teenagers. It was absolutely crucial that they understand the scene situation and that they are able to relate to it. In most of the cases, we changed the translations according to the requirements and suggestions by the teenagers, finding adequate and understandable formulations and signs. In some of the scenes we tried to make use of poetic means that are characteristic for sign languages, thus creating a poetic imagery only possible in a visual language like DGS. In the actual performance, the text was a complex mixture from spoken words, sign and projected writing, combined with sound, music and multisensory rhythmic elements like stomping. Our aim was to make a performance for Deaf and hearing audiences, but not by the means of a mere interpretation, but as the result of an aesthetic process involving Deaf and hearing actors and actresses. So there are scenes and episodes that are spoken or signed or both, or entirely without words. According to the audiences’ linguistic backgrounds, the given information slightly changes. Some scenes are accessible rather to signers, others to hearing people – everybody is sometimes left out. Sometimes one group has an advantage, sometimes the other one. But all in all, the plot and the text are accessible to all of them. Although we are still searching for the best means to communicate with Deaf and hearing audiences – and I’m sure the search will never be at an end –, I hope we have been able to give to every audience member an insight to something new. Maybe some hearing spectators had an impression about the artistic potential of sign language, and some Deaf spectators could participate in a performance which goes beyond mere interpretation. I’m sure that being part of a mixed audience, hearing and Deaf together, certainly is a very special experience to most of us – and this is one of the most important functions of theatre: coming together. To get an impression of the show, watch the trailer or visit the websites of Possible World with a lot of photos and further information about „MEDEA!“ and other projects (English and German). Rafael Ugarte Chacón is doctoral student at the Institute for Theatre Studies at Freie Universität Berlin. He is writing his thesis about aesthetic means in artistic performances for Deaf and hearing audiences. Kaite O’Reilly workshop and panel discussion at Southbank Centre 30th August 2012. Thursday 30 August 2012. 3.30pm. Southbank Centre, London. 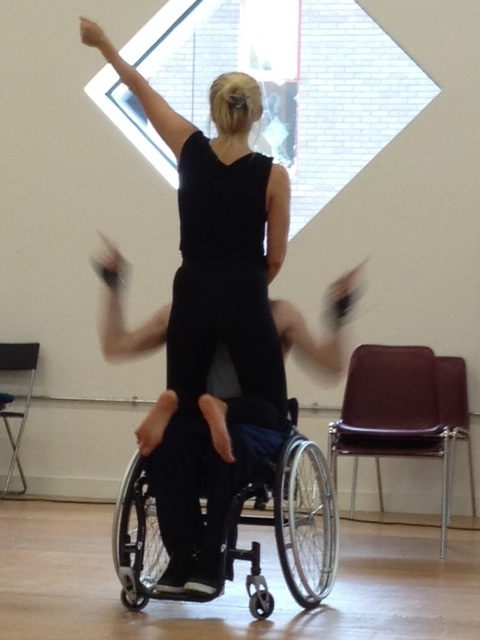 An introduction to making performance work which, in both content and form, reflects a world that is more inclusive, challenges hackneyed representations of disability, and creates new narratives, protagonists and dynamic form. The creative and theatrical possibilities of access devices or tools – sign language interpretation, audio description, projected text or subtitles, for example – are still not being widely explored. This workshop begins to consider these as the potential means to artistic innovation and exploration, rather than an ‘add on’, illustrated by examples from Kaite’s texts and productions within the ‘mainstream’ and disability arts and culture. Please note – this free event requires a ticket. You can reserve your ticket online (£1.75 transaction fee) or by phone on 0844 847 9910 (£2.75 transaction fee). Transaction fees apply per transaction, not per ticket. You can also reserve your seat without a transaction fee by visiting one of our Southbank Centre Ticket Offices in person. Kaite O’Reilly’s ‘In Water I’m Weightless’ with National Theatre Wales appears at Southbank Centre as part of Unlimited. She won the 2010/11 Ted Hughes Award for New Works in Poetry for her new version of Aeschulus’s ‘Persians’, for National Theatre Wales. A dynamic panel discussion exploring the creative use of voice and sign language within live performance. The speakers include artists Kaite O’Reilly, Jenny Sealey, Ramesh Meyyappan and Sophie Woolley. Southbank Centre will present the Unlimited commissions across the site in a high profile festival to coincide with the 2012 Paralympics. The Unlimited commissions invited artists to think big and develop dream projects that they would not otherwise have had the resources to create. The programme is about artists pushing themselves to reach previously unattained goals. The 29 Unlimited commissions range widely in artform including dance, live arts, visual arts, music and theatre. The Unlimited programme will put the spotlight on the artistic vision and originality of deaf and disabled artists, giving them space to present their work and share their practice more widely. Unlimited is a London 2012 Cultural Olympiad project. The project is principally funded by the National Lottery through the Olympic Lottery Distributor, and is delivered in partnership between London 2012, Arts Council England, Creative Scotland, Arts Council of Wales, Arts Council of Northern Ireland and the British Council. The Mrs Malaprop of British Sign Language. Translation of photo: Jean St Clair calls ‘time’ on Kaite O’Reilly’s ‘weird’ signing. I first met Jean St Clair ten years ago, when she was working as the BSL (British Sign Language) advisor on a production of one of my plays in London. I was immediately drawn to her skills, knowledge, and ingenuity as a linguist, expert in Sign performance, and superb performer in her own right. In the 1980’s Jean toured internationally and appeared in the West End in Mark Medoff”s Children of a Lesser God. Together with Jeni Draper, we formed The Fingersmiths Ltd in 2006, exploring bilingual performance, aspiring for equality of BSL and English, Deaf culture and hearing culture, on stage. 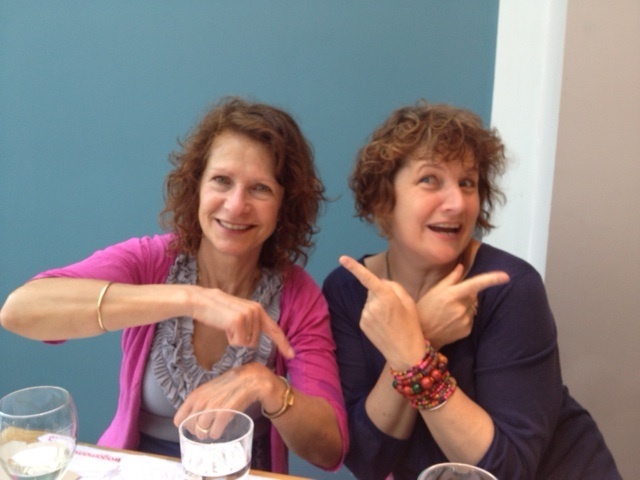 Jean and I are a fabulous conundrum – she a profoundly Deaf signing practitioner who doesn’t use voice, me a speaking, hearing viz imp writer who signs enthusiastically but eccentrically. I’m the Mrs Malaprop of the bilingual world. Some signs have similar elements, but differ according to a particular hand shape, placement, or movement, and so our conversations are littered with my errors over many years, which have become part of our shared vocabulary. Instead of ‘let’s video that section as a memory aid’, we’ll say/sign ‘let’s Liverpool lesbian that’. I confused ‘politics’ with ‘milk’ six years ago, so now Jean signs ‘do I want milky politics?’ when she makes me a cup of tea. It’s a wonderfully humorous engagement, generous and good natured, embracing the potential creativity and comedy of linguistic mistakes. Jean came into rehearsals this week for National Theatre Wales’s In Water I’m Weightless, my Unlimited commission for the Cultural Olympiad. We worked with performer Sophie Stone and super ‘terps Julie Hornsby and Jo Ross (Sign Language Interpreters extraordinaire), reworking excerpts of my English language text into BSL and sign performance. I try not to use the term ‘translation’, as I agree with playwright/linguist Colin Teevan’s assertion that there’s no direct correlation between languages – and especially between spoken and signed languages, which are experientially different, even using different language centres in the brain. It’s an exciting and complicated process. Put briefly, Jean and I discuss the text, ensuring we have a shared understanding of the content, and also my intentions. Depending then on the context, Jean will either work a theatricalised BSL version of the English, or create a more visual version, using what she calls the Visual Vernacular – a mingling of movement, gesture, and mime, informed by BSL. This is just the preliminary work, done before going into the rehearsal space and working alongside Sophie, Jo, and Julie. I will be writing further about these elements at play in the production as the rehearsals continue – ‘access tools’ used creatively – integrated into the wider performance. In Water I’m Weightless – what means sound, anyway? Some great experiments with text, spoken and signed languages in rehearsals today. One of the monologues I wrote is called Switch On/Switch Off (After the Operation), about the controversial subject of cochlear implants. The monologue, structured as a speaking and signing chorus, explores the experience of ‘hearing’ for the first time. The piece is inspired by several friends I have on both sides of the Atlantic, who decided to have cochlear implants in their middle years. Both told me of the long process learning how to decipher and interpret what initially seemed quite abstract noise into meaningful sound. One told me of her experience going for a walk and realising birds sang – and had different songs, notes, tone, rhythm. This notion captured my (hearing) imagination, and so provoked the monologue.